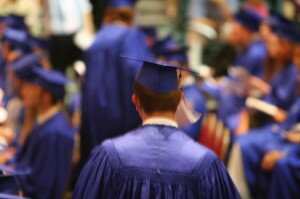 PIMA, Ariz. — Students from a high school in Arizona recently joined together in prayer of their own accord after their local school district discontinued its long-held practice of presenting invocations during graduation ceremonies. According to reports, Esperanza Gonzales and Calleigh Summers led students in an invocation and benediction informally last week after the Pima Unified School District announced that it was removing prayer from this year’s program. Superintendent Sean Rickert had made the choice to forgo prayer at this year’s graduation ceremony out of his claim that he was keeping the district in compliance with the Establishment Clause of the U.S. Constitution. He contended that school-sponsored prayer could set the district up for a lawsuit, but said that potential legal action was not the reason for his decision. “Our primary reason is to make sure we are not violating student’s rights,” he told the Eastern Arizona Courier. Board President Tom Sullivan agreed, stating that the district’s legal counsel advised the board to remove prayer from the official ceremony. But the announcement caused outrage among many local residents, who flocked to a board meeting earlier this month to express their disagreement with the decision. Out of a standing room only crowd, over 20 area residents spoke on the matter at the meeting, the majority of whom expressed their desire to keep prayer in the ceremony. When officials didn’t budge, students decided to present the prayers anyway, even if they were separate from the sanctioned program. According to reports, some students also handed Rickert a marble upon graduation as a symbol of their belief that the superintendent had lost his marbles by removing prayer from the ceremony. Rickert said that he actually appreciated the student’s “rebellion” by offering an informal invocation and benediction in spite of the their removal from graduation. Esperanza Gonzalez, one of the students that presented prayer at the event, said that she knew she did what was right.